(Clockwise) 1. The grama sabha ‘katte’. 2. The change-makers led by GP president Mahadevi Vali. 3. The GP office in Gummagol. Waste-wise, water-wise, solar-powered roads, a composting yard, a nearly foolproof sanitation scheme and willingness to achieve a lot more by involving everyone in the village, especially children. To top it all, its Gram Panchayath (GP) is headed by a woman. If I ever want to live in a village, this would be it. Period. It’s always heartening to read about the winds of change. It gets even better if those winds blow from a back-of-beyond rural setting. 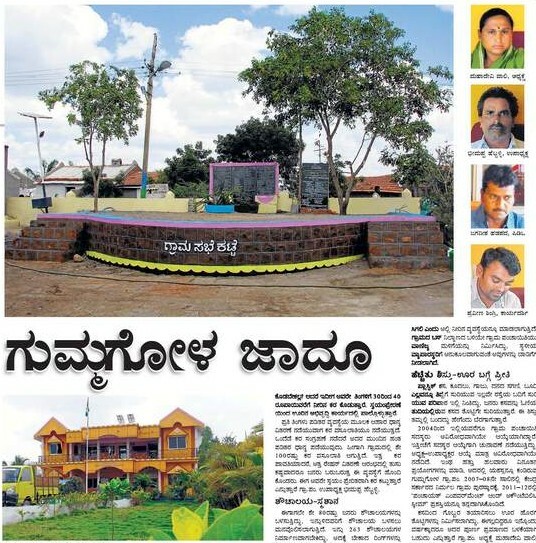 According to Vishalakshi Akki’s feature in yesterday’s Prajavani, this hinterland of happenings is Gummagol of Navalgund taluk, Dharwad district. A shining example of what an efficient GP can achieve provided it has its heart in the right place and is ready to embrace progress in its true sense. What makes this modern fairytale involving 4,000 people all the more remarkable is how it resurrected itself from its stagnated state where people refused to pay tax and worse, they stole power directly from the lines. But since 2004, small but significant efforts made by a team of 11 GP members, of which five are women, have changed the way the villagers behave and feel about themselves. A no-tax-no-ration rule has people falling in line. Now, power dues are down to zero and tax reaches the GP in time. How truly different they are! They segregate waste and have set up a plastic collection centre. Schoolchildren collect plastic as part of their weekly ‘Shramadaan’ and store it here for recycling. For solid waste management, a sizable yard has been set aside and very soon, a vermi-composting unit is coming up. All the waste is dumped in strategically located dustbins which gets collected periodically. No littering. Clean roads. Over 80% of the population owns toilets and the rest is covered by public toilets. In fact, the GP is building toilets for 20 BPL from its own funds. All the streetlights are solar-powered and the GP is planning to solar-power the entire village. Water was a luxury but now, with efficient utilisation of government schemes, the villagers have water coming to their doorsteps. However, I would say, some dug wells and well-kept tanks would have painted this picture to perfection. With change came a string of awards. This has certainly brought about an elevated sense of happiness among the villagers of this Little Republic. Pride is evident, so is their enthusiasm to scale new heights. Gummagol is a slap on the face of the so-called educated urban-dwellers who think it’s none of their business to keep their own living space liveable. It’s always someone else’s job, isn’t it? Such sense of entitlement! As far BBMP, all it needs to do is open its eyes and realise that it doesn’t have to waste taxpayers’ money on touring exotic foreign locations to “study” change. This entry was posted in Endlessly Green, Free Flowing. Bookmark the permalink. Amazing and my inspiration and aspiration…. Came across this yesterday and thought of sharing the story with non-Kannada speaking readers. Most often, it’s the regional language papers that cover such wonderful development stories. I find this journalism extremely fascinating. It is all about 1% inspiration and 99% perspiration..Kudos!! Am sure all this happened BECAUSE it has a woman GP head.